Ryan Light celebrated his 100th game as manager of Bexhill United Football Club with a comfortable home victory on Saturday. 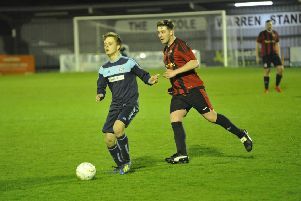 The Pirates scored two goals in either half to win 4-0 against Midhurst & Easebourne and consolidate top spot in Southern Combination League Division One. Although playing into the wind, Bexhill started like a house on fire and took the lead inside two minutes. A miscued Midhurst clearance was picked up by Jack Shonk, who played in Drew Greenall and he finished sharply into the bottom corner. Bexhill had things all their own way during the first part of the game as they produced a very controlled and dominant performance, and it almost seemed a case of how many goals they would score against third-from-bottom opposition. They doubled their advantage through a goal of real quality from Jack McLean, who started out with the ball on the left before cutting across the box and firing into the far top corner. After that goal, Midhurst - who Light described as the biggest side Bexhill have encountered this season - used their physicality to get themselves into the game. Although home goalkeeper Dan Rose didn’t have a save to make, Midhurst were a bit quicker to the ball than Bexhill and were keeping it better. Bexhill used half time to regroup a bit and were much better during the second period, although for a while the game seemed to be fizzling out, which Light wasn’t happy about as he felt there were more goals to be had. Light brought on Georges Gouet, Wayne Giles and Liam Foster, and the substitutes injected a bit of life into the match. Bexhill went three-up when Kyle Holden went past three or four opponents on a fantastic driving run before poking the ball through to Giles, who finished nicely. Giles then turned provider for the fourth goal, winning the ball near the byeline on the right before pulling it back for Gouet to score his first Bexhill goal of the season with the outside of his right foot into the bottom corner. “We had plenty of chances to win by a greater margin, but some games you have to grind it out and the clean sheet is always pleasing,” added Light. Bexhill: Rose; Robertson, McGuigan, McFarlane, Lopez; Holden, J. Bunn, S. Bunn (Foster); Shonk (Gouet), Greenall (Giles), McLean. Southern Combination League Division One top half standings (played-points): 1 BEXHILL UNITED 14-34 (+38 goal difference), 2 AFC Varndeanians 13-34 (+26), 3 Steyning Town 13-33 (+20), 4 Alfold 14-32 (+23), 5 Seaford Town 13-25 (+6), 6 Selsey 14-24 (+9), 7 Hailsham Town 14-23 (+20), 8 Wick 13-21 (0), 9 Littlehampton Town 14-19 (-5).